There is an eye shadow palette for everybody. Some, like the Charlotte Tilbury Instant Look In Palette, are for beginners. In fact, Charlotte’ palette is a ” color by numbers”, palette. Furthermore, it guides you labeling the pans with numbers. So, you follow the numbers to apply your face, eye, or cheek color. Other palettes, are more difficult to use. Viseart, once only used by professional makeup artists, recently came to Sephora and Beautylish. However, the brand is famous for its use to make up the actors and actresses in films around the world. Also, Viseart was very popular on French Television. Now, we too can use the vividly pigmented powders. Additionally, we can experience the Viseart soft, smooth, and creamy formula. 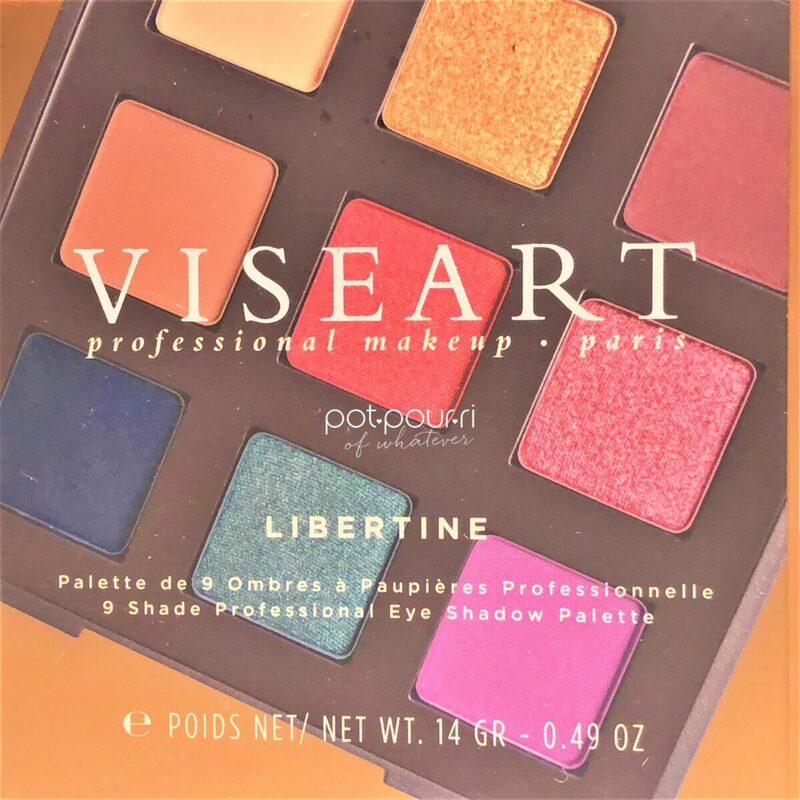 The newest Viseart palette, Viseart Libertine Eye Shadow Palette, encourages us to try the newest vivid shades. To begin with, most of us are not professional makeup artists. Either we are makeup junkies, or we just love to wear makeup. Normally, we do not run out to buy professional makeup palettes. 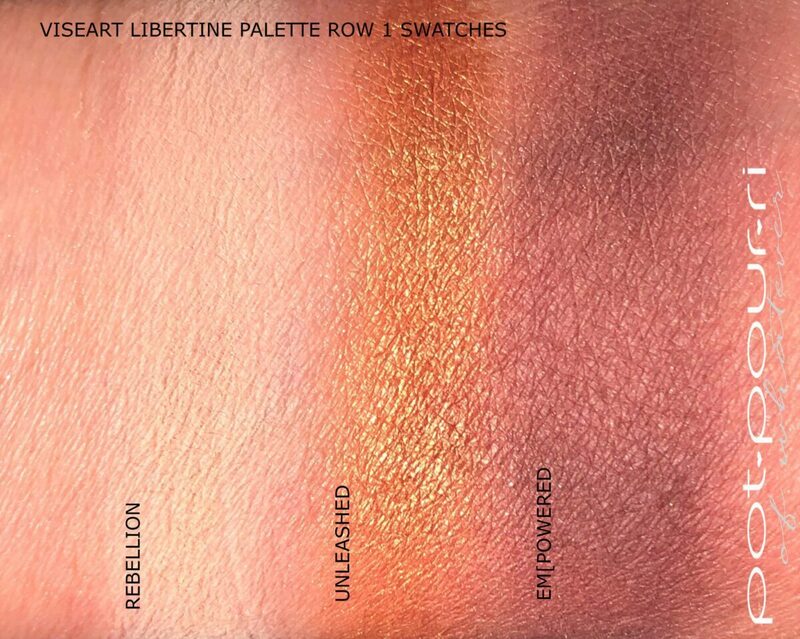 However, the nine shades in the Libertine palettes are so beautiful, it is worth it to try them. Also, Viseart is well- known for their buttery, blendable signature powder eye shadows. As a result, it would be fun to try them. Dont you think? 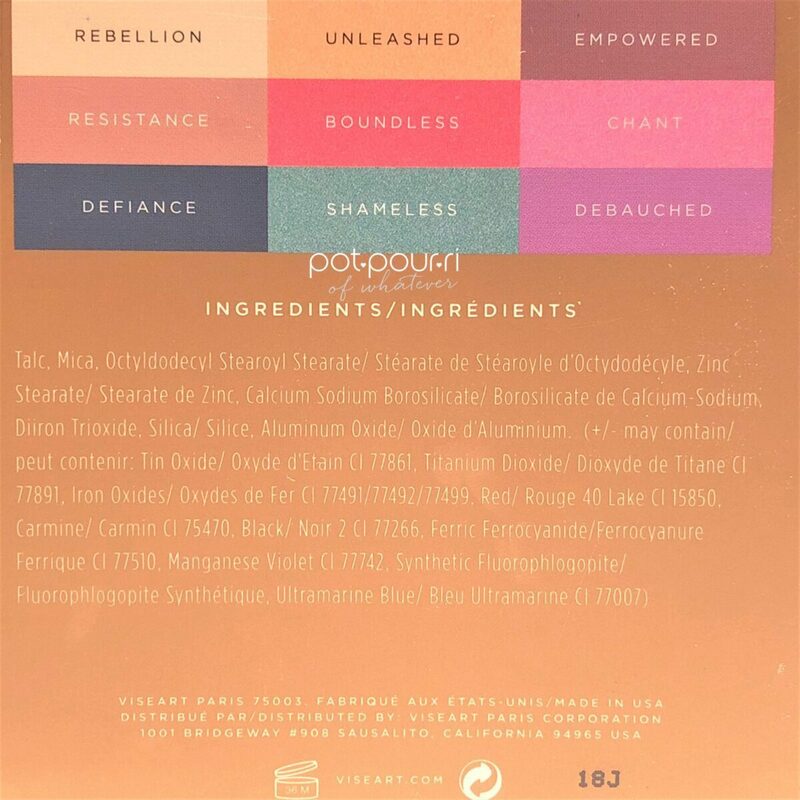 After all, there are a lot of great things about the unconventional shades in this palette. For instance, they’re liberating! 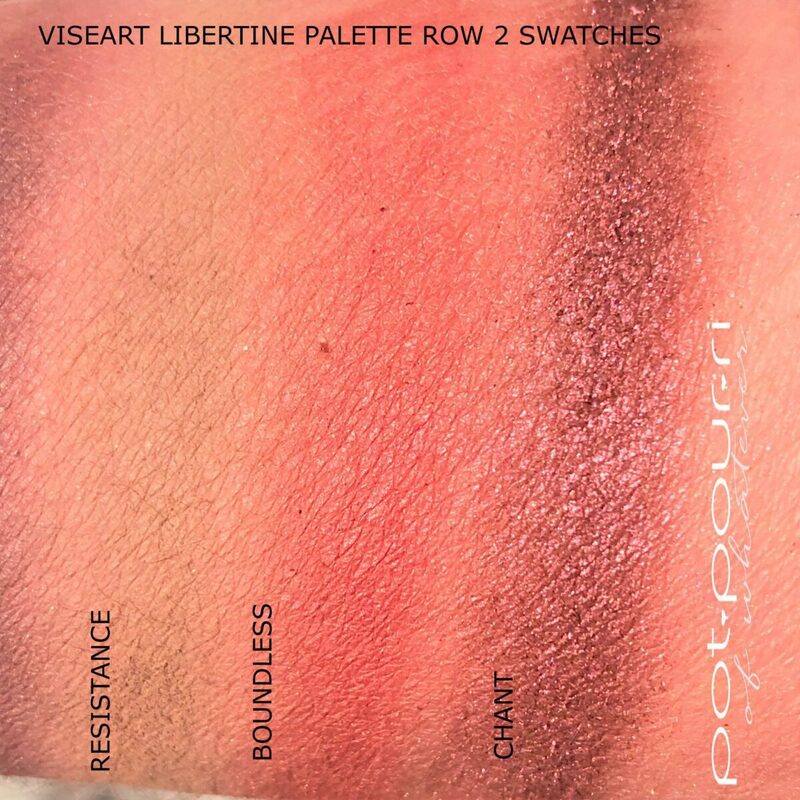 So, let’s go…..
You can find the Viseart Libertine Palette at Sephora and Beautylish. The palette retails for $49. I really love this compact. It reminds me of a tin box of candy. Only, when you open the lid, there are nine eye shadow beauties inside. Also the packaging is really sturdy. Metal is stronger than cardboard. In fact, I think more eye shadow palettes should come in metal compacts. I love that it’s sturdy enough to throw in your handbag, luggage, or briefcase. Then, you can touch up any time you want. You don’t have to worry if it gets knocked around. The powders won’t crack and break, like some other palettes (Bobbi Brown Infrared!) Additionally, there is a nice-sized vanity mirror in the palette. So, all you’ll need is a brush! 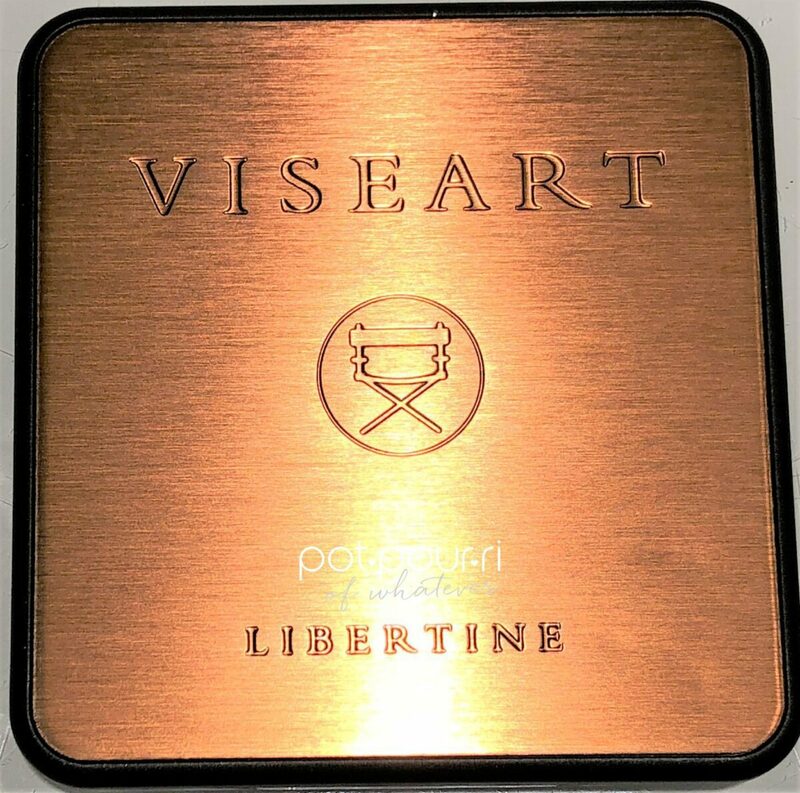 Viseart ‘s Libertine eye shadows come in matte, metallic, and pressed pigment finishes. First, the pressed pigments finish formula allows you to use your eye shadows as liner. The pressed pigments are hard pressed to create a wet/dry eye shadow. As a result, , they are able to hold more water. In addition, they are packed with extra (pure) pigment. Some of the shades can be used as an all over sheer wash of color. Also, they are less creamy than the Signature Formula. Although, others have a dry texture. Those shades feel grainy. They don’t build well. Use these shades with a wet brush to line your eyes. The Viseart Signature Powder features triple milled powders. As a result, you get intense color payoff. Above all, these shades feel creamy, and buttery. They are easy to blend with other shades. Rebellion is a soft light Ivory shade with a matte finish. Also, this shade feels soft and silky. In addition, the pigments are opaque on the lids. Finally, it is a long-wearing shade. Next, Unleashed us a deep gold shade with a metallic finish. Also, the gold shade has a soft, creamy texture. It is smooth and easy to work with. Furthermore, it applies smoothly and gives opaque coverage. Last, Empowered is a merlot pressed pigment with a matte finish. It takes two layers to have full color coverage. Also, use it dry for a wash of color. And, use it wet to line your eyes. Resistance is a creamy camel shade with a matte finish. You’ll get rich color coverage. Also, the texture was smooth, and it blended easily. Boundless is a shimmering crimson semi-matte shade. It is opaque with one layer. The texture was slightly dry. Although, it was still easy to blend. Last, Chant is a burgundy shade with a metallic finish. It has a smooth texture. Also, it is light and creamy. Moreover, it is easy to blend. Finally, it was long-wearing. First, Defiance ,pressed pigment, is in a deep midnight blue shade with a matte finish. Applied dry, the shadow was semi-opaque.. It was more opaque when used with a wet brush. I love this shade as an eye liner. It doesn’t blend out well. Therefore, I wouldn’t use it to create a smoky eye. Next, Shameless is a teal pressed pigment with a metallic finish. It is an opaque shade with good color payoff. The shadow, in the pan, was lightly pressed. Therefore there was some kick up in the pan. However, it applied smoothly, and blended well. 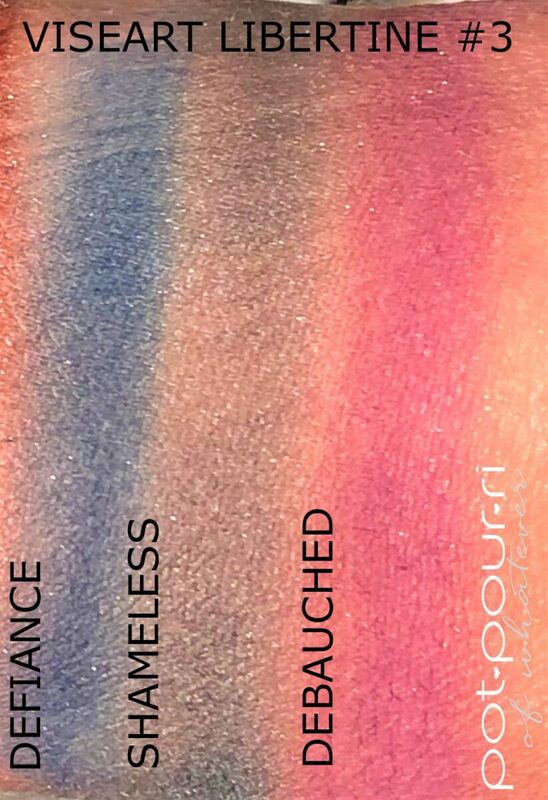 Last of all, Debauched is also a pressed pigment. Also, it is a deep fuchsia shade with a matte finish. First, use it all over as a wash of color. Next, use it with a wet brush to line your eyes. The texture was dry and grainy. It did not build well. This is not a typical, fuss free palette. However, the unconventional shades and new formula finishes were not made for the faint of heart. Ask yourself, “Do you want to work with a drier formula finish and create an eye liner with it? 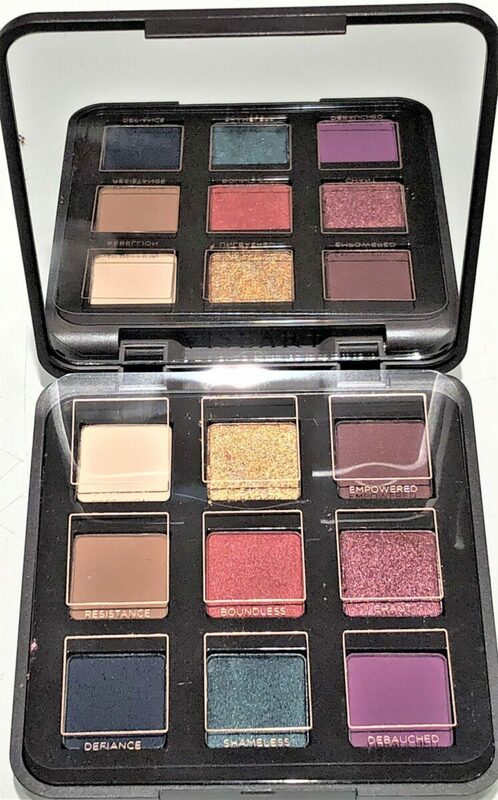 Are you a makeup artist?” I love the palette. 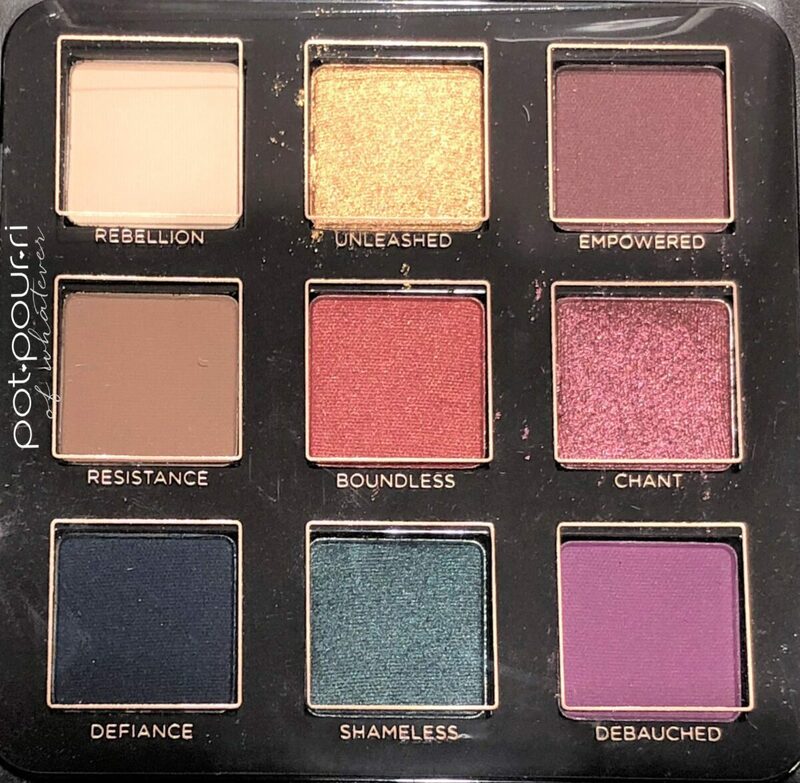 It has nine beautiful shades. Some of the shades are creamy and easy to work with. The drier shades are easy to use with a wet brush. I like using shadows as eye liners. One reason is, they seem to last longer. Another reason is, you have a lot more color to choose from. It’s up to you. Or, are you up to it?